Since it seems that just about every '55-57 Chevy coupe ever made is still on the road (well, if you can call cruise nights and car shows "the road," that is), we tend to forget that The General sold plenty of Chevrolet coupes during the years immediately prior to the Small-Block Era. 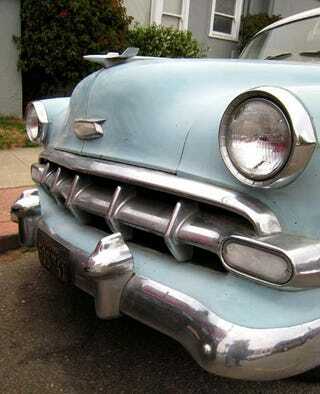 They were lookers, too- even after 53 years, this unrestored '54 really ads some style to its West End neighborhood. This was the last year that Chevrolet buyers didn't get a V8 option, but at least the ol' stovebolt six now came with a pressurized oiling system. Hmm... that Stovebolt qualifies for Workhorse Engine Of The Day, doesn't it? There's still quite a bit of early-postwar styling here, but you can see how the look of the '55 evolved. That great big trunk would have been excellent for moonshine running, but the Fords were just so much quicker in '54. Of course, there was no law saying a man couldn't drop a 265 or 283 in his '54, once they became available. The more space-agey taillights of the late 50s were cool, but the simpler lines of the early postwar lights have their appeal as well.